Just some of the thoughts that swim around in my head. Insecurities In Relationships: It’s Not Them, It’s You. Time for yet another one of my revelations: Most (if not all) problems in a relationship can be traced back to insecurity. Reflecting on my own experiences in relationships I’ve realized that any time I felt angry with, or hurt by my significant other, it wasn’t about something they did – but an insecurity they triggered. That time they canceled plans because they had to work late, the subconscious insecurities triggered probably went something like: “They must not want to spend time with me. Work is more important to them than me. I better make them feel guilty so they show me they love me again”. This isn’t to say that the things your partner does aren’t objectively wrong in one way or another, but any extreme negative reaction on your part is always based in some personal insecurity. This speaks to the REBT principle that we do not react to an event, but only to our interpretation of that event. Greek philosophers agree, so you know it must be true. Most of us have a psychological make-up that’s a veritable land-mind of insecurities, planted there throughout our life experiences. We view each new experience through a lens of our personal fears, doubts, beliefs, and biases. So when we explode at our partner for not being there on time – we’re not just mad at them, we’re mad at our father for not showing up to our little league game – only we’re not usually conscious of it. I would even go so far as to suggest that, due to a most basic need to love and be loved, every variety of insecurity is rooted in a fundamental and universal fear of not being loved… but that’s a tangent you can read more about here. Relationships consist of a series of bids for love and support from our partners, that we hope will ward off that scary feeling of not being loved. Will you comfort me in this situation, or invalidate my feelings? Will you make me feel wanted, or reject me? Can I depend on you for this, or will you disappoint me? In other words, we’re constantly looking to our partners for feelings of security – security within the relationship, and security with ourselves. When they don’t fill this need, it hurts, and it feels scary. It triggers that deeply buried and powerful fear – that maybe we’re not loved… maybe we’re not even lovable. This extends past relationships too. We might look to many other things in our external world to make us feel more secure – our jobs, our bank accounts, our looks, our achievements, etc. We convince ourselves that if these factors are just right, we’ll be secure, we’ll have value, we’ll be lovable. If we don’t feel secure, we assume it’s because one of these factors isn’t where it should be. So we try to change our external world. We try to get more money, or a more prestigious job title. Some people will starve themselves, or have surgery to feel more attractive. In relationships, we fight and argue in attempts to force the relationship to meet our needs for security. We try to change our partners into people that act in ways that will always make us feel secure. It’s true. Research has found that being in a relationship with someone who has a secure attachment style can make us more secure. If you’ve never heard of attachment styles before, the basic idea is this: Our early interactions with our parents (or primary caregiver) lays the foundation for what we expect and thus how we behave in future relationships. If our parents were consistently available when we sought them for comfort and support, we’ll develop a “secure attachment style” in which we’ll be able to get close to others and trust them to provide us with love and support. However, if our parents were unavailable or inconsistent in attuning to our emotional needs, we’ll develop an “insecure attachment style” in which we have a hard time trusting that others will love and support us. People with secure attachment styles show more empathy in their relationships, seek out support from others more easily, communicate their feelings more easily, and are more trusting. Insecurely attached individuals might be anxious and clingy in relationships, or distant and avoiding, or a confusing combination of all the above. The silver lining is that shacking up with someone who has a secure attachment style, can help you feel more secure in your relationships. So this is good news, but not the perfect solution in my opinion – because I think depending on your partner to make you feel secure can only go so far. Even people with secure attachment style have relationship difficulties, and feel insecure at times. The problem is that anytime we are looking externally to feel more secure – we will be inevitably be let down. We might feel better momentarily, but it’s simply not sustainable. Our partner gets us flowers to apologize for messing up, and we might feel loved again – but it’s a matter of time until something else starts to make us feel insecure. This is because we can never control other people, and so we can never be 100% certain that they will feed our need for security. In fact, nothing about the external world is completely dependable, or without risk. People are unpredictable, our jobs are unpredictable, the world is unpredictable. 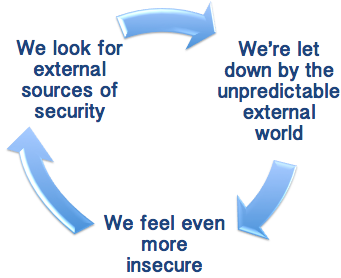 Relying on external sources of security only creates a negative feedback loop that makes us feel less secure and even more dependent on those external sources. The only true source of security is from within. We might exert all kinds of effort trying to control the rest of our world, but the only thing we can really control is ourselves. So what if we put as much effort into mastering our ability to choose the perspective we take of the world? What if instead of trying to change our partners into people that are better at making us feel secure, we change ourselves into people that fill our own need of security? What if we could provide ourselves with our own secure attachment to ourselves? What would this look like? Well we would give ourselves the type of love, validation, and responsiveness that we hope for from our partners. We would recognize and respond to our own needs with patience and care. We would trust ourselves to love and respect ourselves no matter what. We would put effort towards developing ourselves to be the best version of ourselves, for ourselves. Once you realize this, your relationships will improve. With this in mind, I have two things that I say to myself when I’m having difficulties in a relationship. In other words, when we’re upset we automatically start blaming things on our partner’s issues, it’s really always about our own issues. By making a habit of saying these things during any interpersonal conflict, I remind myself to look inward for the reasons why I am so upset. Once I do this I can work on addressing my own insecurities that are fueling the problem, without making my partner responsible for them. Being aware of how my own insecurities are contributing, I become calmer, more objective, less defensive, and more open to my partner’s perspective. I can communicate my needs and insecurities to my partner without hostility, opening the door for issues to be dealt with in a productive way. Doing this then builds trust, support, and intimacy. Paradoxically, when we are less dependent on our partners to make us feel secure, intimacy flourishes and our relationships actually become more secure. By being able to provide ourselves with the validation and support we need, we can simply enjoy our relationship without trying to make it serve our needs. We can accept our partners’ differences and short-comings, because they no longer threaten our sense of security. And so we become better romantic partners. We become the type of person that our significant other wants to be with, wants to love, wants to support, etc. This is amazing. Thankyou for writing this. I’m not unfamiliar with most of these ideas but you put them across in a very helpful way. I just came across this while searching for something to soothe my current phase of insecurity. I’ve heard these things before, maybe a million times, but they haven’t hit home the way they did today. Thank you, thank you, thank you. You might have felt attacked when your partner said that, and that’s an insecurity. You feel insecure because you fear not being loved. Staying with someone who doesn’t respect us, likely is a reflection of our own fear/ability to be alone. Being secure in self tends to block out these insecure people with exploitative personalities, like that displayed by your ex. Being secure in self is attractive to insecure people, but in your ex-boyfriend’s case, this is likely intentional to ward you off (fear of direct confrontation), or an attempt to make you more submissive to him. Relationships are a game for an uncaring dominant partner, leaving the one seeking something “serious” to suffer. Don’t need for someone, like an already missing piece of yourself, this is a burden for both people in the relationship. Instead, secure yourself to your own life, and then find someone who compliments your day. Maybe he was just telling the truth? It’s not something that we want to hear, but none of us really know how we will feel about someone in the future, we can only guess. A lot can happen in 6 months. We don’t know anything about the rest of the relationship, so we don’t really know if he was being manipulative or what. Helen, You’re bang on in your reply. He might very well be making a truthful statement….he doesn’t know how he will feel. Of course he could’ve added…I hope I love and care for you more in 6 months. The truth is none of us can truly say how we will feel in the future. We can hope, we can work towards, we can try and build, etc. But we won’t truly know until we reach that moment in the future. Thank you for writing this ~ it’s clear you’ve spent a lot of time thinking about it. I’m struggling to find the limits of this “what are my own issues” question. My spouse of 10 years and one child is using this line of reasoning to persuade me that I should be ok with changing our marriage from monogamous to “we should be able to develop romantic and sexual relationships with other people”. I’ve been reading the books and going to the discussion groups, and over and over I’m hearing that my wanting to stay in a traditional monogamous marriage is a sign of my insecurity and need to control others. Really? Then is every marriage just a way to control people, or is there some valid place from which to say, “I want us to honor the comittments we’ve made,” without it being about my issues of insecurity? That’s a very complicated situation, and I’m sorry you’re dealing with the stress of resolving it. I hesitate to respond too in depth without a better understanding of you, your partner, and the situation, and would highly recommend seeking couples counseling to help you work through this. But I will say that I don’t believe insecurities are necessarily invalid. For example, it’s completely valid to feel insecure in a relationship if a partner has cheated on you. That insecurity might cause one to act suspicious, jealous, angry, etc. The behavior is based in the person’s insecurity, but that doesn’t mean it’s invalid by any means. I believe it’s important to understand our insecurities, be mindful about how they influence our behavior, and consider them when making decisions in relationships. It seems reasonable that a non-monogamous relationship would make you feel insecure (as I think it would make most people insecure) and there’s nothing invalid about that feeling. You just have to decide if that insecurity is something you want to work towards resolving (if you think it can be resolved), or if you want to make choices in your relationships that accommodate that insecurity (i.e. choosing strictly monogamous relationships). I hope that makes sense, and is helpful. Good luck. It can be a challenge when both partners need different things during emotional situations i.e. one partner needs space to process, while the other partner needs affection and connection. During times like this it can sometimes be helpful if the partner who needs to space can provide verbal reassurance that after they have time to process they WILL return and try to give their partner what he/she needs. If you experience your partner taking some time to process, but then returning more open to showing love/connection, gradually you might become less triggered by them temporarily distancing themselves. Hope that is helpful. This was a great article that makes a lot of sense. I have a serious issue with trust and insecurity. I’m not even sure what’s the cause of it. But After a 15 year relationship with my ex, I was single for about a year to give myself time to think about life and what I truly want in my next relationship. I dated here and there, then found this great woman which I’m currently with. We’ve been together for a year now and while things have gotten better, it’s been a rough ride. She hasn’t cheated or anything like that, but for some reason I always feel…Insecure.. I struggled at first to even admit that it was insecurity and lack of trust since I didn’t see why I would have issues with that. I’m not Brad Pitt, but I’ve never had a hard time going out on dates since I’m a pretty decent looking guy. I think I have a good heart, and I’m not a dummy lol.. But even tho I feel I’m a good catch, I still struggle with insecurity. My gf tells me that it wasn’t like this at first, that she didnt see this side of me. I guess once I truly fell in love with her, my insecurities came out and big time. This has put a tremendous amount of stress in our relationship. I worry that she’s checking out other guys all the time. She says its very difficult to go out with me because of this. Then I ask her questions if I see guys that I may think she may think are attractive. She tells me that she’s in love with me and that she doesnt feel attraction to anybody else. Obviously I know there are other good looking people out there but she really wants me to believe that while that may be true, that to her, she doesnt see anyone like that. I do struggle with that part. She tells me that’s how she’s always been, not just with me. That when she’s in a relationship, that she only has eyes for her partner. I’ve had issues in my past relationships with infidelity. I’ve cheated and was cheated on once as well. Not sure if this plays a role. I truly have no idea how to overcome this. I think at times that maybe she’s not the one for me since I feel such strong insecurity with her. But then I realize that she hasn’t done anything. It’s gotta be me. She also likes to dress kinda provocative. This also bothers me. She gets upset when I mention this because she tells me she does it for herself. That she doesnt do it for attention or anything like that. I find that questionable and obviously this makes me think other things as well. She works in a profession that deals with a lot of men, humane society, so thats another thing that pops to mind. My mind wonders if she’s finding other people attractive. Its a freaking constant struggle and its going to kill my relationship if I dont change. I’m going to see a therapist per her request. But I dont really know if my troubled thinking can be fixed. Scary to think that.. Any advise would be highly appreciated…. Yours truly… Concerned man with too many troubled thoughts. I’m sorry to hear that you’re having such a difficult time, and hopefully therapy will be able to help you understand where some of your insecurities come from, and how best to cope with them. As I discuss in the article, looking to your girlfriend for validation (asking her whether she is attracted to other men etc.) might provide some instant relief from a troubled thought, but isn’t likely to make your insecurities go away. You’ll always wonder if she is telling the truth, and end up dependent on her constant reassurances, which as your finding can put a major strain on the relationship. So the trick is finding a way to cope with your insecurities more independently. Check out my post on Mindfulness Meditation. You may not be able to directly eliminate your troubled thoughts, but you can work towards accepting them and become more conscious of how you react to them. It’s the difference between “I’m afraid my girlfriend is attracted to someone else – I must ask her for reassurance so I feel better!” and “I’m having insecure thoughts right now. They’ll probably pass. I don’t have to react to them or try to make them go away” Once you become more able to tolerate feeling insecure/anxious, you won’t need your girlfriend to reassure you as much. Once you are less dependent on your girlfriend for managing your insecurities, you might the insecurities themselves reduce. Hope that is helpful! Hi Marcelo. I too have had this problem with no actual provocation from my new partner. The trouble is I have accused him on 4 seperate occasions of doing something which may be cheating or dishonesty, merely because my insecurities made me suspicious and it got the better of me to the point where I approached him and blurted out my ‘concerns’. Naturally he was quite taken aback and couldn’t believe I could dream up such stuff. I could see he was genuinely innocent of all ‘charges’ and it has taken this to illuminate my problem. I have had past hurts from a cheating partner and it has taken its toll on me but assuming the next partner will do the same is setting myself up for deepening these insecurities. ‘I’ am the problem and only I can deal with this and to learn techniques of how to get on top of my insecurities and hope that he can forgive me for being so unfairly accusing. He is angry and I think probably worried that maybe he is now partnered with a paranoid delugenal woman…this is the last thing I want him to feel as I really love him. He has distanced himself a bit since this recent accusation and I wish I had been made more aware of my insecurities before today so I could have learned how to discipline them before they could do harm. I urge you to seek counselling and learn to control this unattractive behaviour. No one wants to be in a relationship that is suffocating and feel they are always being ‘watched’. Get help and good luck. Emma- This article was a very good read, especially for someone who has been dealing with relationship insecurities for a long time. I am hoping you can help me here, due to the fact that you have taken time to answer some posts from above. I am a successful and good looking (so I am told!) individual who has dated several women over the years. When I look back on it, I have only been insecure in the relationships where I have been in love. (Only a couple). I have currently been in a relationship for the past six months with someone that I have fallen in love with and care very much about. My problem- 3 months back she was unsure about getting into a serious relationship and we went our separate ways for 2 weeks or so. This was devastating and still bothers me to this day. Nonetheless, she realized that she wanted to be with me and we got back together. As hard as it was for me to accept her back, I did because of how much I care for her. She is naturally a person (Including her family) that keep to themselves. This includes maybe a few text messages a day. (we do not live together) This bothers me at times because when this happens for longer periods of time, I worry that she will become unsure again. This creates me to get passive aggressive and retreat back. What are your thoughts in helping me through this? There is definitely potential here for a happy relationship. I’m sorry this slipped through the cracks and I’m just seeing it now. It doesn’t sound too uncommon for someone to only feel the need to reach out to their partner a few times a day, but it seems like this is triggering some insecurities in you – which is valid, and likely influence by the time you spent separated. You might want to work on finding a balance between expressing your needs to your partner, and trying some meditation or relaxation techniques to self soothe when feeling anxious about hearing from your partner. A therapist could help you learn to self regulate when apart from your partner. Check out the book “the 5 Love Languages” for help explaining your needs to your partner. Hope that was helpful and thank you for reading! I find these cut and dry articles always skirt the very real possibility that the feelings that one has can be and have been proven to be VALID, and not just what they are feeling. If we are only to look to ourselves for self love and our partner walks all over us and we go along with an “it’s not you it’s me” attitude, then likely we develop a feeling that whatever is happening is a-ok. blanket statements of “see if you are the problem” doesn’t allow people to honestly look at what partners are doing. As a survivor of an abusive relationship, I spent the better part of 2 years trying to convince myself that it was just my insecurities when I was being abused. It didn’t allow me to see that I needed to get out of the relationship and that it wasn’t just me or my deep seeded issues that caused this. To me, this is telling people to ignore bad things in a relationship because it is just in their head. Far too many people have stayed in abusive situations because they were convinced by blanket articles, or even their abusive partners that they weren’t doing anything wrong, the victim was simply too touchy, or insecure. Unhealthy message to put across for sure especially as there is no indication that you should sometimes look at the person’s behavior and ensure that what you are reacting to is not just you, but them. You make good points, and thank you for sharing your perspective because it brings up an issue I considered adding into this article, but ultimately decided it might be deep enough to warrant a separate article. My intention would never ever be to blame a victim of an abusive relationship or otherwise unhealthy relationship. I do believe that insecurities, low self-esteem, etc. on the part of the victim contribute to the cycle of abuse. Addressing insecurities from within and cultivating your own ability to provide yourself with unconditional love empowers one to seek healthier relationship and settle for nothing less. Obviously this is easier said than done, and I don’t want to invalidate how difficult the journey to safety and healing is for a victim of abuse. But do believe the same principles are true. It’s not about pointing gingers or placing blame. It’s about finding love by starting from within. It’s an important distinction that I probably should have addressed in the original article, so I thank you for your attention to it. Very good article. Let me ask this, is it possible your partner accuses you of being insecure when you’re not? Maybe for the sake of never having to answer any personal questions or having to defend their reasoning for anything that might make them uncomfortable? Can the insecure label prevent people from asking the questions they really want to know? For example, I asked the question to my bf how come you don’t introduce me as your gf? Almost word for word. The answer I got was sorry you’re insecure. I guess you can assume by the question it was attacking in nature, but if I got a reasonable answer I would have left it alone. Emma – thank you so much for this article. I got in my first relationship this year after meeting this wonderful girl in another country. We came from the same city in the US, and we became official this year when we came back from that country. I never knew I had relationship insecurities until a month ago, my girlfriend mentioning she got lunch with her ex that day. My first reaction was I was so shocked. How could she get lunch with her ex? I would not do that (had I had an ex). My mind became just polluted with these negative thoughts on that she was going to leave me, that she’s getting lunch with her ex for a reason, and that she told me after it happened because she was hiding something from me. I even got very emotional, and even a little angry at her, that she could do such a thing to me, to “destroy” my trust in her. But we talked about it afterwards, and I noticed that I overreacted, and that if I imposed restrictions on her, it will only make her feel constricted in our relationship. So I told her I was sorry of my overreaction, and that she should do what she wants. The next day, she told me her ex messaged her and that they should grab lunch again, because the lunch yesterday wasn’t very good. She told me she didn’t reply to him yet, and is unsure if they want to do it. She told me honestly. Again, this brought up all my negative insecurities again, and I was visibly emotional, upset, and uncomfortable that she brought him up again immediately after our conversation last night. I am still working on this insecurity, but in the least, I am aware of the fact that what I’m feeling is not because of my girlfriend, but because of me. Seeing the fact that there are many people like this out there that feel insecurities in their relationship, and that it’s us we need to work on, helps a lot. THIS IS EXACTLY WHAT’S GOING ON IN MY LIFE!!!! It was like I was reading about me. I love my spouse with all my heart and he loves me just as much, but I always want more love and more affection, I can’t get enough!! I feel like he is being distant and avoiding me, but he really isn’t. I have no idea when or where all of these insecurities started, but I wish I wasn’t like this. He’s never given me any reason to doubt him, or distrust him. I feel like our relationship is broken, but he says it’s perfectly fine. I’m so lost and have no idea where to turn. I don’t even know what to say to get help or do I need help? Is this something I can tackle on my own? I’m thankful seeing all of these comments it’s not just me and there are others out there with similar problems. Great article. I came across this after a night of attending a great concert alone (Thievery Corporation…check them out if you have a chance) and realizing yet again how much I love myself 🙂 I think you make some amazing points regarding a concept which one of my favorite spiritual teachers Tara Brach calls the “U-Turn” of looking back to yourself as emotions arise to mindfully observe where those emotions come from. If we are honest, we will find that there is generally a reason for everything and when we let our higher (cerebral cortex) minds to do the thinking – versus our primitive minds – our thinking is a lot more clear and productive. This being said, I would recommend something else to consider and that is that each of us – men and women – have within us aspects of both the masculine and feminine (masculine being defined (in a very basic way) as a strong assertive coming forward to fix and protect and the feminine being defined as strong nurturing and holding and caring for in a gentle and tender way). If we give ourselves time to really connect with each of these energies, we realize that they make a complete, balanced and happy union within each of us. We also find that our failure to observe these qualities in ourselves leads us to seek them out in another because we are always intuitively looking for balance and stability. As you say, when we seek things out in another we come to rely on that other person to address our needs which inevitably leads to disappointment and further distrust of others. Therefore, the more we can find a completeness within ourselves, the more we can be happy alone or in a relationship. Once again, great article and thanks for sharing your thoughts. Thanks for reading and adding those interesting insights! I’m a big fan of Tara Brach as well! Jersey girl living in Philadelphia, pursuing a Psy. D. in clinical psychology. I like to write about psychology, relationships, personal growth, and other random topics that pique my interest. My loves in life are my chocolate lab, bean burritos, and the ocean. Stop Categorizing Other People… and Yourself! 8 Things You Should Be Doing In Your Relationship: Because Science Says So!